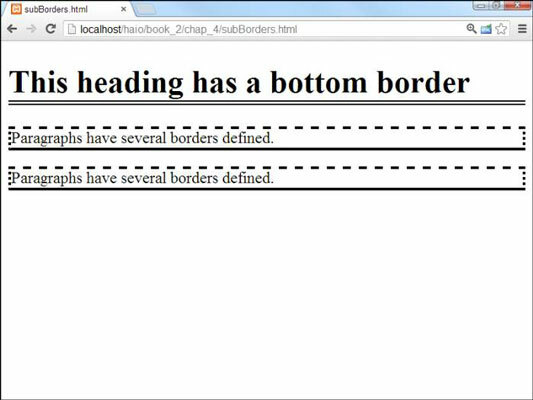 You can use CSS3 to draw borders around any HTML5 element. You have some freedom in the border size, style, and color. 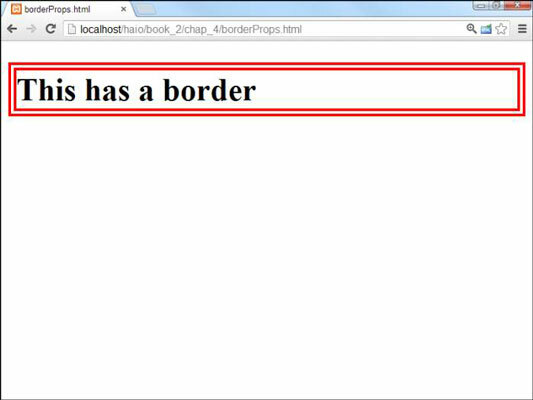 Here are two ways to define border properties: using individual border attributes, and using a shortcut. Borders don’t actually change the layout, but they do add visual separation that can be appealing, especially when your layouts are more complex. Here is a page with a simple border drawn around the heading. color: The color used to display the border. The color can be defined like any other color in CSS, with color names or hex values. style: CSS supports a number of border styles. The example illustrates a double border. This draws a border with two thinner lines around the element. You must define all three attributes if you want borders to appear properly. You can’t rely on the default values to work in all browsers. 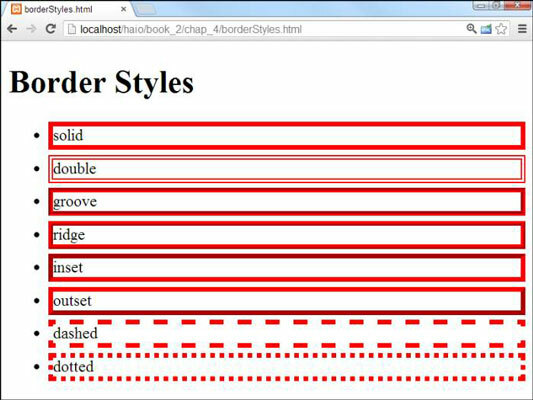 CSS has a predetermined list of border styles you can choose from. Here is a page with all the primary border styles displayed. Solid: A single solid line around the element. Double: Two lines around the element with a gap between them. The border width is the combined width of both lines and the gap. Groove: Uses shading to simulate a groove etched in the page. Ridge: Uses shading to simulate a ridge drawn on the page. Inset: Uses shading to simulate a pressed-in button. Outset: Uses shading to simulate a button sticking out from the page. Dashed: A dashed line around the element. Dotted: A dotted line around the element. Defining three different CSS attributes for each border is a bit tedious. 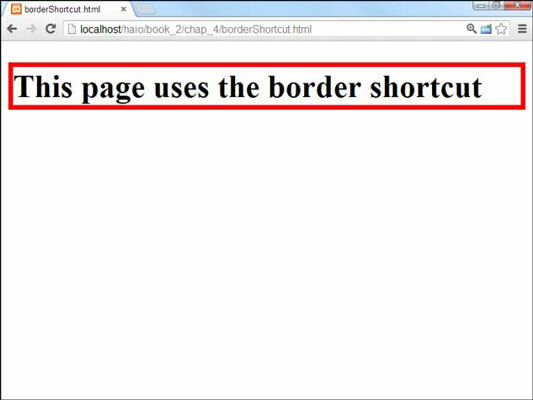 Fortunately, CSS includes a handy border shortcut that makes borders a lot easier to define. The order in which you describe border attributes doesn’t matter. Just specify a color, a size, and a border style. If you want, you can have more precise control of each side of a border. There are a number of specialized border shortcuts for each of the sub-borders. Paragraphs have several borders defined. Notice the border styles: border-top, border-bottom, border-left, and border-right. Each of these styles acts like the border shortcut, but it only acts on one side of the border. There are also specific border attributes for each side (bottom-border-width adjusts the width of the bottom border, for example), but they’re almost never used because the shortcut version is so much easier.